#44 Just Take The Picture! I take hundreds of pictures. Without exaggeration. I am not a professional. Nobody is going to be paying your mom to take pictures any day soon–but I do it anyways. Your father hates being in pictures–but I snap photos of him regardless. Pictures tell a tale. They can tell it from many view points. Pictures mark history. Pictures keep our history rich and alive. Pictures remind us of what we love and what we value at any point in our lives. Take pictures and store them away. Make crafts from them. Hang them on your wall or share them with friends. Take pictures that you keep only for yourself. Take pictures of things you find beautiful and things you find ugly. Use pictures to mark life in brief moments. There is a time and a place for professional photos. Thank heavens your father and I know two great photographers or else we might not have many of the beautiful portraits, the pictorial memory of your birth, and a great record of our wedding day like we do. However there are many times where it doesn’t matter what camera you have, what skill level you are, what you are wearing, or if your hair is done. What matters is that you take the picture. You capture the moment and you freeze it. Just like a song you truly love–a good picture is one you can look at over and over again and still have the same feelings you did in that moment of taking it. I hope that some day you will look at the photos I take of you and your father together. That even though he hates having his picture taken–you two will get to sit together and reminisce about the memories you have created together that I do my best to capture. That you will blow the dust off the ones I printed or load the ancient files onto whatever device is hip at the time and share the moments–the memories–the day to day actions of your parents and yourself with your own children and maybe even grandchildren. When I snap the photo and your dad ducks or uses you as a human shield from the forces within the camera I laugh and keep going–knowing that one day he will squeeze my hand as we turn the page in our album and say thanks for the memories. Whatever you do darling, Just Take The Picture. 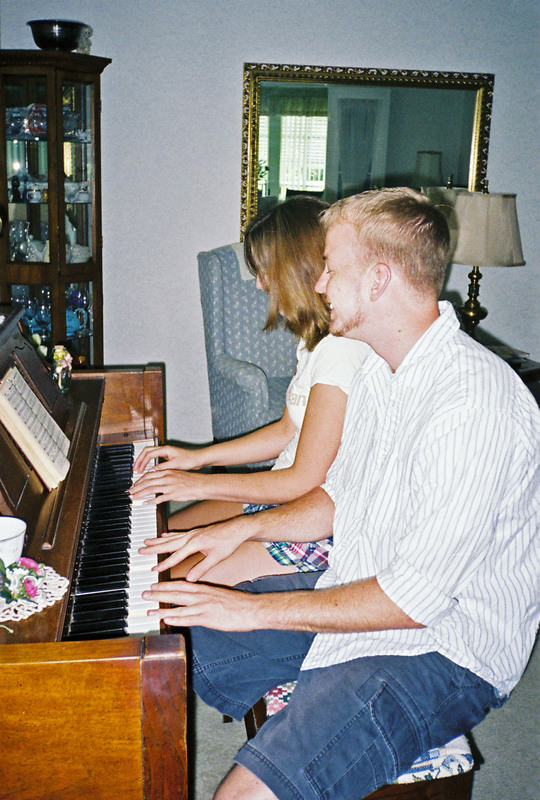 Your Dad and I playing Piano in 2006 When He Came to Visit me in Florida and I Knew he just might be The One.